The House mouse is a small rodent, with a body measuring 3 to 4 inches, and a tail ranging from 2 to 4 inches; for a total (approximate) length of 5 to 8 inches. They vary in color from white to grey, and light brown to black. Usually discovered living in close proximity to humans, the House mouse can often be found in or around houses and fields. Originally from Asia (most likely Northern India), humans have helped the House mouse spread; to nearly all parts of the World. House mice thrive under a variety of conditions. This species of rodent is commonly discovered in and around homes and commercial structures; as well as in open fields and farm land. 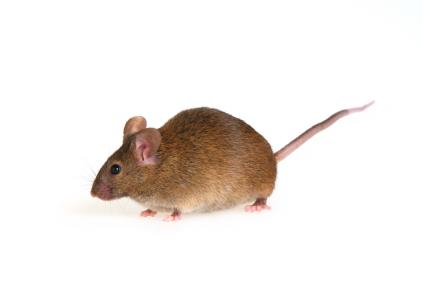 House mice are known to create pest control problems, by consuming and contaminating food supplies; and animal feed. As well, this pest can cause considerable damage to crops and property; and transmit sickness and disease. Most active during dusk or night; House mice do not like bright lights. Primarily feeding on plant matter, this pest may choose to live in a variety of dark hiding places; located near ample sources of food and water. Generally a poor competitor, It is unlikely that the House mouse would survive away from human settlements, in areas where other small mammals are present. For example, mice are afraid of rats, which will often prey upon, kill and (partially) eat them.